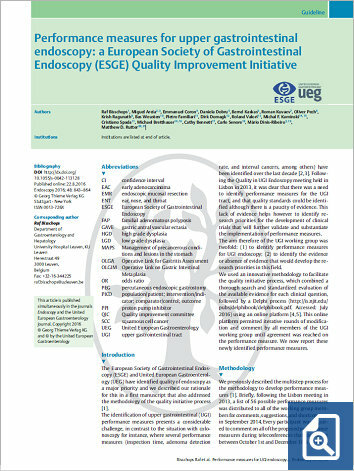 The European Society of Gastrointestinal Endoscopy (ESGE) and United European Gastroenterology (UEG) have identified quality of endoscopy as a major priority and we described our rationale for this in a first manuscript that also addressed the methodology of the quality initiative process . The identification of upper gastrointestinal (UGI) performance measures presents a considerable challenge, in contrast to the situation with colonoscopy for instance, where several performance measures (inspection time, adenoma detection rate, and interval cancers, among others) have been identified over the last decade [2, 3]. Following the Quality in UGI Endoscopy meeting held in Lisbon in 2013, it was clear that there was a need to identify performance measures for the UGI tract, and that quality standards could be identified although there is a paucity of evidence. This lack of evidence helps however to identify research priorities for the development of clinical trials that will further validate and substantiate the implementation of performance measures. The aim therefore of the UGI working group was twofold: (1) to identify performance measures for UGI endoscopy; (2) to identify the evidence or absence of evidence that would develop the research priorities in this field. We used an innovative methodology to facilitate the quality initiative process, which combined a thorough search and standardized evaluation of the available evidence for each clinical question, followed by a Delphi process (http://is.njit.edu/pubs/delphibook/delphibook.pdf. Accessed: July 2016) using an online platform [4, 5]. This online platform permitted iterative rounds of modification and comment by all members of the UGI working group until agreement was reached on the performance measure. We now report these newly identified performance measures.